Dr. Steve Shirley began serving as president of Minot State University on July 1, 2014. As Minot State's president, Dr. Shirley also has oversight for MSU’s affiliate two-year campus, Dakota College at Bottineau. Between both campuses, there are more than 4,000 students and 500 faculty and staff. Prior to joining Minot State, Dr. Shirley served as president of Valley City State University from 2008 to 2014. Earlier in his career he was vice president and dean for student affairs at Dakota State University in Madison, S.D., and an assistant professor of business and director of study abroad at the University of Minnesota, Crookston. Dr. Shirley is a member of the Minot Rotary Noon Club and previously served as club president of both the Valley City and Crookston Rotary Clubs. He currently serves on the North Dakota March of Dimes board of directors, and is an ex-officio member of the Minot Area Development Corporation, the Minot Area Chamber of Commerce (serving on the Military Affairs Committee), and the Minot State Development Foundation. Shirley has been a Junior Achievement volunteer, has taught English to adult learners overseas, and has led several groups on international exchange visits. He is a strong advocate for global education and study abroad, the focus of his Ph.D. dissertation. Dr. Shirley currently serves as chair of the board of directors of the NCAA's Northern Sun Intercollegiate Conference. 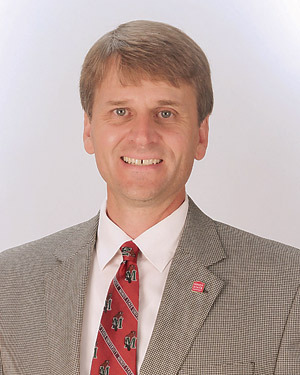 He previously served on the National Association of Intercollegiate Athletics Council of Presidents. He has presented at national conferences, and previously served on the Region IV-West Board for the National Association of Student Personnel Administrators, chaired the Dakota Athletic Conference, and served as organizing chair for the North Star Athletic Association. A Fargo native, Shirley earned his bachelor’s and master’s degrees in business administration and his doctorate in teaching and learning, all from the University of North Dakota. Additionally, he completed the Harvard Graduate School of Education’s Institute for Educational Management. Shirley is a fifth-generation North Dakotan, and he and his wife, Jennifer, are the proud parents of 7-year old, Anna, and 3-year old, William. Anna is in first grade and loves Minot’s Roosevelt Park Zoo, and William is full of energy and growing by leaps and bounds. The entire family enjoys attending Minot State events, and both kids are huge fans of Buckshot Beaver!